H L Motors was founded in 2003 and has been growing ever since. Our family run garage now has three experienced full time mechanics plus our office staff. Our unit is based on the Friday Street Farm (also known as Gearings Farm), Oak Tree Lane and our farm based location enables us to keep our prices low and competitive compared to main dealers or garages based on other Industrial Estates. 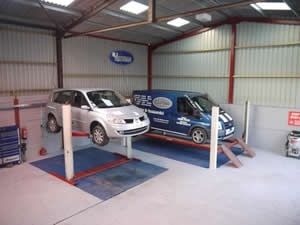 We have all the latest equipment and technology which enables us to undertake some specialist services such as diagnostic work, Air-Con servicing and re-gassing or 4 Wheel Laser Alignment. We also repair and service motorbikes including Off-Road motorbikes (MX, Enduro or Quads) and since 2014 have an on-site bike shop, H L Racing (www.hl-racing.co.uk) which stocks various bike oils, parts and associated accessories or apparel for off road bike sports.